Get a long phone cord and pace back and forth during business conversations. Use the stairs instead of the elevator (even going downstairs). Take midmorning and midafternoon activity breaks (sanity walks) rather than coffee breaks. Perform stretching exercises at your desk; walk to another floor to use the bathroom or get a drink of water. WALK. Take a brisk 3D-minute walk each day, and in one year you could lose 18 pounds. 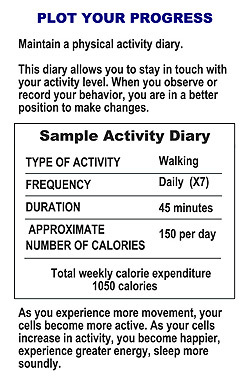 Walk 4 miles per hour and you will expend 5.8 calories per minute X 30 minutes = 174 calories 174 calories X 365 days = 63,410 calories expended per year. 63,410 calories/3,500 calories per pound = 18.1 pounds per year. This example illustrates the cumulative effect of activity! Park further from your destination and walk. Get off the bus before your stop and walk. Ride your bicycle rather than drive your car. Get involved in activities like aqua-aerobics, swimming and rebounding on a mini trampoline. Try tennis, hiking or golf. (When golfing, walk, avoid using a golf cart. The difference between walking the golf course and using a golf cart is 6.5 pounds per year or 65 pounds over 10 years.) Other recreational activities include volleyball, bowling and dancing. Recreational activities allow you to make increasing the amount of movement in your life a social event. Plan an activity program. Make increasing your level of physical activity part of your short-term and long-term goals. Establish realistic activity goals. Find the right time for activity. Plan activities which are compatible with your daily,routines. Vary your activities. Seiect activities that you can do but that you don't do at the present time. Plot your progress. Keep it fun. Remember, engaging in virtually any activity you aren't doing now will increase your total energy expenditure.